Steve Diller has helped hundreds dogs and their people. If you have a testimonial for Steve, please enter it below! Steve Diller knows dogs! It's been seven years since I brought my Portuguese Water Dog, Rudy, to Steve's puppy class, and I still think of him every time I ask Rudy to sit, stay, come, or heel. Steve gave me and my family the tools to actually become Rudy's best friend, and he did it with grace, humor, and kindness. He knows dogs, he loves them, and you'll love him. Thanks Steve! Steve shared his passion for dogs with me when I was starting out as a trainer. He is a great teacher who is genuine and thoughtful with both people and dogs. I truly appreciate all he has taught me over the years. I am an animal rescuer and have known Steve Diller for eight years. Steve is not only a top-of-the-line trainer, but he has wealth of knowledge on everything from dog behavior, to dog health and well-being, to animal rescue and placement. Steve takes a serious interest in each and every one of his clients and their pets. I can feel confident that if I send a dog with behavioral issues to Steve, he will do everything in his power to keep that dog in its home, while always taking the safety of the dog and the owner into account. As an animal rescuer for over 12 years, I have seen very few trainers of Steve's caliber. His knowledge of dog behavior is unparalleled, and his compassion for dogs and devotion to his work is nothing short of extraordinary. I first met Steve Diller when our new family dog was just a puppy. We had adopted her from a "breeder" on the internet who claimed that she breed Wheatan Terrier/Poodle mixes. I brought my pup to Steve and introduced her as my new Whoodle! Steve said, "she is very cute, but she is definitely not 3 months and she is no whoodle!" Lulu ended up being the best mixed-breed mutt in the world...and the most amazingly well behaved puppy in class! With such patience and knowledge Steve taught my kids and I so much about how dogs think and why they act the way they do. I had been to other trainers previously, but Steven not only knows dogs, but is a great teacher for the humans! By the end of Puppy Kindergarten, Lulu graduated with honors and had become such a beloved, well-behavied family dog we ultimately adopted 2 more puppies and brought them to Steve for training also. I can't thank Steve enough for making my 3-dog household workable! I would recommend Steve Diller to anyone anytime. My experiences with Steve have been nothing short of perfect. Steve has worked with all three of my dogs, and I don't think you will find a better trainer never mind person out there. Steve is compassionate, patient, and as far as I can see part dog!!!! 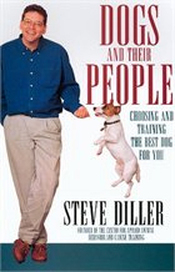 Steve Diller is a great teacher, dog trainer and human being. He’s kind and thoughtful about all that he does concerning people and their dogs. You can’t go wrong in hiring Steve as he has vast knowledge and experience with dogs and their behavior, and he’s wonderful with people – that’s a truly great combination. I can’t sing his praises enough! Steve Diller is a dog trainer extraordinaire. Whether he is teaching pups good house manners or dealing with dogs with emotional or behavioral issues, Steve’s innovative techniques always prove to be helpful and effective. By combining common sense with time-tested training methods — and always keeping a sense of humor about him — Steve makes training fun for the whole family (both canine and human!). We highly recommend him for anyone who wants a well-behaved pet. I modeled my own career in dog training after watching Steven Diller in action. I've known very few people so skilled at their profession yet so adept in communicating and teaching those skills to their students--with vast reserves of patience and humor--and Steve is one of the best at it. With there being a fair amount of controversy in this profession over certain training tools and techniques, it's reassuring to know that there are still professionals out there who stick prefer common sense and the basics--and just help you get your dog well-trained. Steve, you were there for me when I got my first Rottie. You have gone above and beyond not just helping me train my dogs but giving me the knowledge to understand the psychology of them as well. You have taking it to the level of helping me start a Police K9 Unit for The Town Of Greenburgh, N.Y. which has been a phenomenal success because of you. I couldn't have done it without you and look forward to receiving a pup from your litter for the next Police K9 in the near future. You are my mentor and thank you for always and still being there for me when a new situation arises when I need your expertise. Steve Diller has trained all four of my dogs. He has taught the easy lessons- sit, stay, down, and he has assessed and taught the hard lessons as well. "Not the right dog for you" were some of the hardest words we had to accept, and trusting Steve to assist in acknowledging that we couldn't adopt an older, possessive Great Dane was tough but palatable because I trusted and continue to trust his judgment on all things dog. His calm and quiet way with a dog is reassuring to the dog and the owner and his ease of teaching to new skills to the whole family is a delight to experience. He will continue to train me and my dogs as long as I have dogs! I met Steve when I doing my externship in Animal Behavior in College. I was and still continue to be beyond impressed with his skills as a handler as well as his compassion and understanding of the animals that cross his path. He speaks a language that animals understand and is amazing at getting his message across to both the animals and their owners. I have called him numerous times for advice on my own animals and have referred many people to him. His knowledge and understanding are unsurpassed by anyone I have ever seen. He is well versed in both getting people started on the right track with their puppies as well as solving behavior problems in pets that are already established in their families.